For more than 100 years, Des Moines Public Schools has provided an outstanding education to the students of our community. Today, our school district is a leader and innovator in public education, offering families some of the best educational choices in Iowa as we become the nation’s model for urban education. Home to more than 60 schools located in every neighborhood of the community, Des Moines Public Schools provides families with choices to meet the educational needs of students from preschool through college-level courses. With nearly 33,000 students and more than 5,000 employees, there are a lot of stories to tell about the work and accomplishments that take place each day at Des Moines Public Schools. From news releases and articles to our mobile app and social media, keep in touch with Iowa's largest provider of public education. From teachers and principals to bus drivers and food service workers to financial analysts and technology specialists, Des Moines Public Schools is home to a dedicated team of professionals who all - directly and indirectly - contribute to the education of our students. What sets DMPS apart? We provide families with more educational choices than any place in Iowa, educate top student scholars who go on to attend leading colleges and universities around the world, and are home to teachers recognized throughout the state and across the country as the best in their field. The people of Des Moines elect seven members to serve as their representatives on the School Board. In turn, the Board is responsible for the governance of Iowa’s largest provider of public education. Learn more about your elected School Board members, and access information about past and upcoming meetings. Des Moines Public Schools administrators and the School Board are at work on developing the FY 2017-18 budget, which goes into affect on July 1. On this page you may read a copy of the proposed budget, view presentations made at previous budget-related meetings, see key dates in the budget process, and access other budget information. 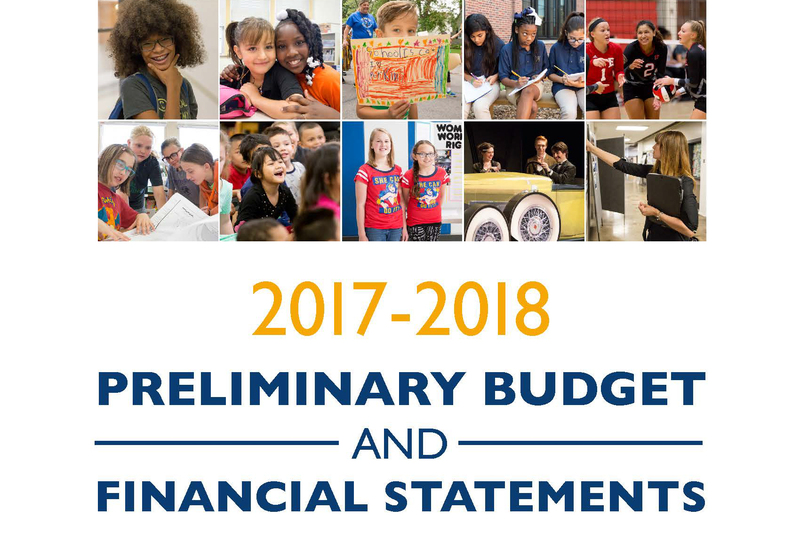 The FY 2017-18 preliminary budget is now available online. The preliminary budget proposes maximum expenditures of $555 million. The historically low funding set for public education creates significant long-term challenges Des Moines Public Schools and public education in all of Iowa. Meet and stay within Board Management Limitations. Maintain financial heath; provide a balanced budget. Keep District Student Expectations and Board Beliefs at the forefront. Review status of all levies; make strategic adjustments as needed. Continue to seek operational efficiencies and improve operational effectiveness. Continue to focus on drop-out prevention and graduation rate improvement strategies. Focus on strategies to close the achievement gap, with added emphasis on males of color. Improve English Language Learners (ELL) programming. Place emphasis on supports for literacy programs and 8th grade Algebra. Create innovative programs to meet unmet needs. Maintain or grow programs that are demonstrating success. Strategically abandon programs that do not demonstrate value. Assess and address curriculum needs and program delivery as needed to stay ahead of advances in technology and digital content. The following are budget-related meetings, both past and upcoming. Please note that dates are subject to change.